Slightly later than planned (apologies – Bank Holiday weekend, and on-going preparations for the Charity Event on 29th April – volunteers still required!! ), we return to Puzzle of the Week! After some light heckling on the apparent easiness of last week’s effort, I can confirm that first prize goes to Paul “can you keep the noise down” Kennelly – well done Paul! Larsen played Bh8 to avoid this but was mated a few moves later anyway. The whole game is worth a look. Golden Lane is Not Paved with Gold! April in the chess season always brings with it a congestion problem. This phenomenon is usually associated with our national sport where there are many trophies, competitions, and vital points to acquire. In other words, the business end of the season. The challenge is also complicated by exhaustion and injuries making this the most difficult part of the season. 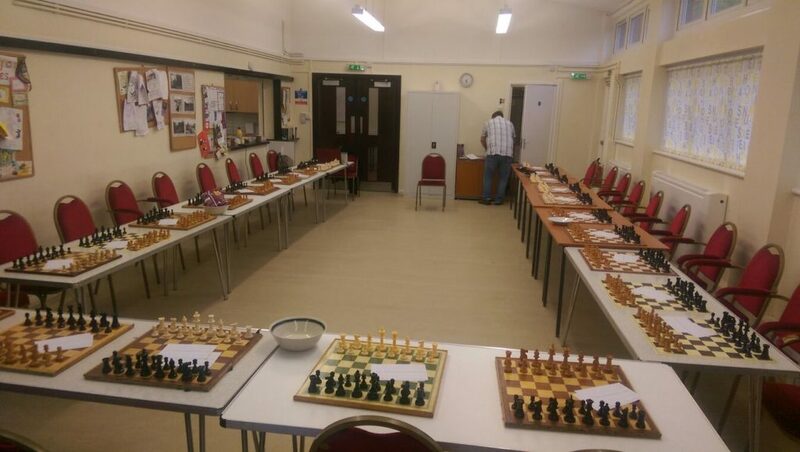 This is where Hammer Chess Club and our match against Metropolitan 2 was critical to our survival in Division 3 of the London League. The previous evening Marios, Brian, Sheikh, Paul and myself were in Hounslow, fighting to retain Division 1 status in the TV League. Unfortunately, we were missing our WOSF of a Chairman and Orial to bolster our ranks. Luckily Brian and David stepped into the breach and the Hammer team were ready. Furthermore, we dropped a point due to a walkover. This made the task of winning or even drawing the match infinitely harder. However, the news was not good – we were pipped 4.5 – 5.5 on the night and this has thrown us back into the relegation mix. We are now in a real fight for survival. The irony is that even with the default we should have won or drawn the match – a familiar tale if you have followed the fortunes of Hammer 1 in LL3. Our recent run of luck finally ran out!! The winners on the evening were Marios, Sheikh and myself. The draws were picked up by Paul, Safi and David. The fallers were Matteo, Brian and Josue. Marios just keeps on going and keeps on clocking up the points. Despite suffering from a horrible cold and an obdurate opponent. He spurned draw offers – Marios got angry. Not visibly, or in his conduct, but in his determination to punish his opponent. In a quick-play finish his opponent finally blundered and lost a piece. Marios converted and deservedly won the game. Moral of the story – do NOT mess with this Greek!! Sheikh’s game – despite him sitting beside me – was a blur. All I know is that Sheikh is in a fine vein of form and really delivering the points for Hammer in all leagues. Sheikhum Style is very much in vogue. My own game was against an opponent I played two years ago. As is customary with me I lost despite having total control of the game – that loss really hurt at the time. Unfortunately, my memory for face is also going south – so I did not recognise my opponent – but it all became clear when he played the Petrov. As he had done two years earlier. For once I rose to the occasion and triumphed in sacrificial style – my best ending of a game this season. I may even submit the last 6 moves to the website. Just remember – revenge is a dish best served cold! Of the drawn games, I only saw brief glimpses – but I can say for sure that David held a pull throughout his game and deserved more than he got. As for Paul and Safi I cannot comment – I saw too little of their games. All I can say is that they have been great players for Hammer 1 this season. The pain of defeat engulfed Matteo, Josue and Brian. I think they would agree with me, but both Josue and Brian were chasing lost causes in their games. They were the sort of games where a loss or the draw was the only result you could get. The longer they went on, the further the draw option retreated into the distance and inevitably they succumbed to defeat. I think they are games they both need to forget quickly. The one who should have drawn or even won was Matteo. Indeed, the computer analysis approved of his temporary sacrifice of a pawn to head for victory. Unfortunately, a common word in this report, he misplayed the ensuing complications. This was a painful loss and in his slightly dejected state he also left his wallet behind. After some rapid calling and texting, he responded and returned to the hall to reclaim it!! On reflection a 5-5 score, even taking into account the default, would have been a fair result for both sides on the night. The luck spurned Hammer 1 on the evening though. Now is is belt and braces time if we are to retain Division 3 status – no more defaults and no more match losses is our goal. Go Hammer – keep the faith!! Author HammerPosted on April 16, 2017 Categories Games, General Chess, Team CaptainsLeave a comment on Golden Lane is Not Paved with Gold! The weary warriors of Hammer TV schlepped over to very West London on Monday night for a critical relegation fixture in Division 1 of the Thames Valley League. We were missing our WOSF of a skipper, Bajrush, who had the poor excuse of needing a holiday!! Cannot blame him in reality and to be brutally honest several of the team last night, including myself, are displaying symptoms of that well known affliction “COS”. Correctly identified as Chessed-Out Syndrome! The heroes of the evening came in the form of Marios, Sheikh and Paul. 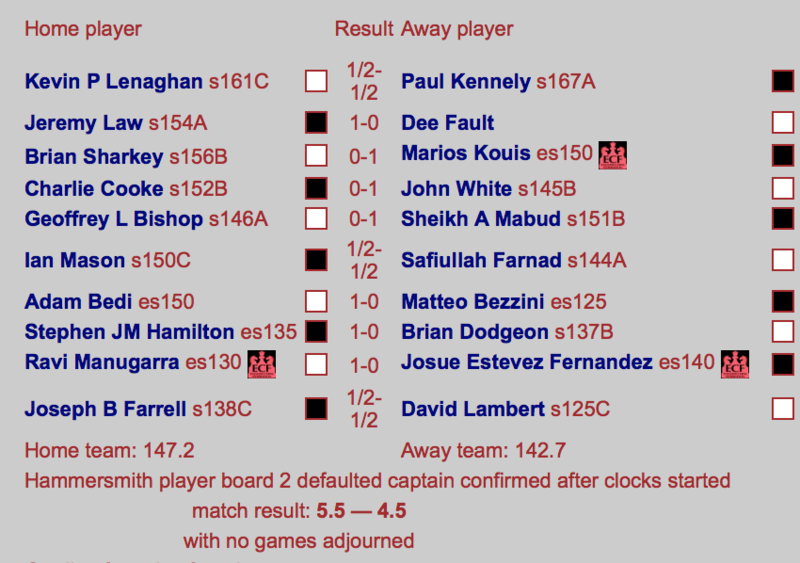 Marios continued his winning start to his London League Chess career with a dominating performance. He was the first to finish and showed what a potent force he is for our club. There is no stopping this man, despite suffering from a horrendous cold, and obviously not well, he just keeps going and knocking them over. Unbelievable! Due to the match layout, Sheikh and Brian had to play their games in another room. This was not great but they both rose to the occasion. Sheikh from what I saw was under extreme pressure on the Black-side of a Sicilian and looked dead in the water. But not for the first time, he was calm and collected in his defence and then proceeded to win very quickly. “Sheikhum Style” is pretty deadly. The ultimate hero of the evening was Paul. His was the last game to finish and we needed a win. In an equal position he probed, he switched his point of attack and in the end Karpov-like, he induced the error from his opponent. Never was a win in TV this season so needed! He was the personification of the Geese saving Rome, Hammer TV’s last stand and he delivered under the pressure. A real clutch performance. Carsten and Brian both drew their matches – Carsten could do nothing with Black in a position that was always tough to win. He agreed a draw as soon as this became clear. Brian had to tread carefully with two knights against a rook and pawn ending but comfortable secured the draw. A good result. Tony played a dynamic game and was overwhelmingly in control but somehow ended up losing a rook in the process of trying to deliver checkmate. He gained a reprieve later when his opponent blundered the rook back, but even so the position was still difficult. With time running out he could not hold back his opponent’s pawns. Just a bad night in every way. Pavel also bit the dust. To be honest he was in difficulty once his opponent’s knight had parked itself on e6, behind Pavel’s pawns, and anchored there with the support of a d5 White pawn. Gradually the pressure built and Pavel just ran out of options. Sacrificing the exchange postponed the inevitable. As to my game I was winning – I was winning so well I had an extra piece – the trouble was his Q-side attack developed unbelievable momentum and I succumbed in meek fashion in the end. A real XXXX of a game on my part. The game ended a 4-4 draw. So, in the end the Hounslow trip was worthwhile – but only just! 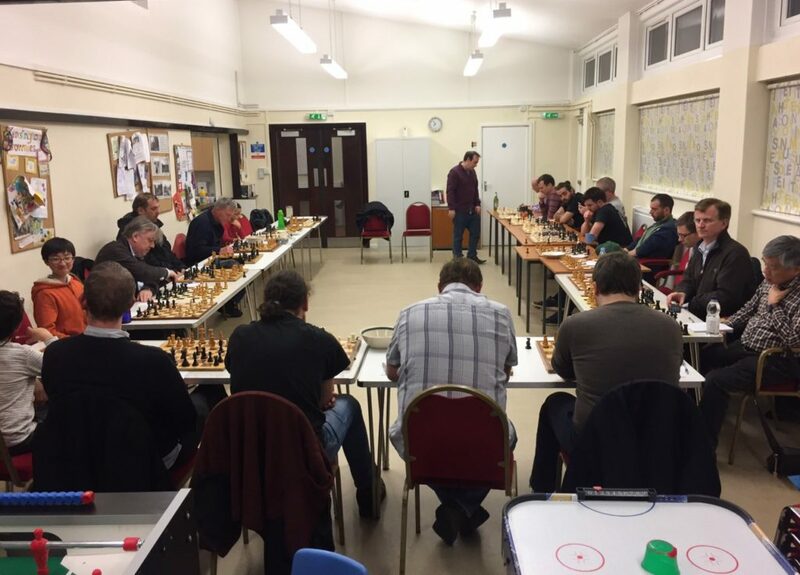 Following hot on the heels of our recent Simultaneous against GM Chris Ward, our only victor of the evening – Marios – has produced a fantastic writeup of the game – check it out here. It’s thrilling stuff and a terrific performance from Marios – he’s rapidly rising to become one of our top players this season! 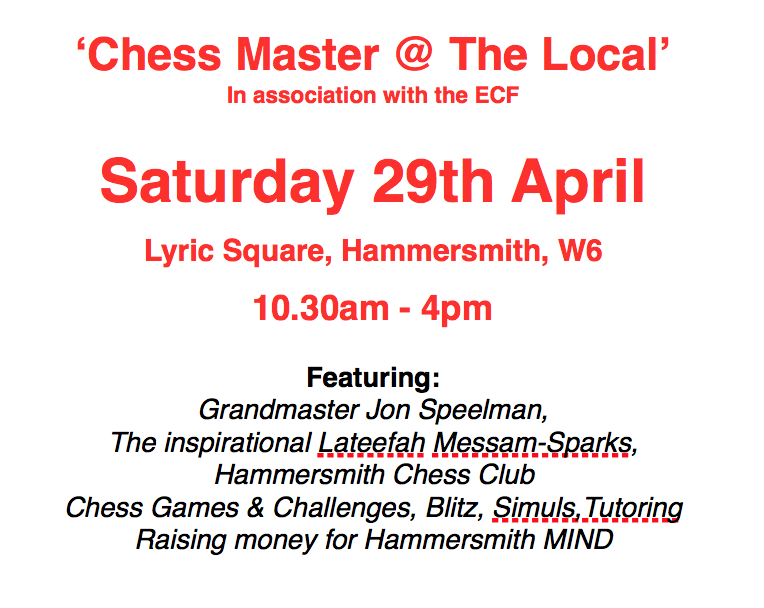 Author HammerPosted on April 7, 2017 Categories General ChessLeave a comment on 29th April – A Call To Arms! 04.04.17 – The might of Hammer and friends took on the challenge of GM Chris Ward this past Tuesday in the hallowed halls of Valhalla… aka Lytton Hall! Twenty souls turned out to take on the former British Champion in a battle to the death. Maybe the quality on our part was patchy – but we had the numbers, the advantage of home turf and the hunger to improve on our encounter with Chris last year. Plus we had secret plans and clever tricks – thank you Roald Dahl – to throw him off his game… more of that later! Before relaying the events of last night, I have to thank Chris on behalf of the club for schlepping over to West London to take us all on. Let’s have a look at the old scoreboard before examining the high points of the evening. Chris won 17 games, drew 2 and lost 1. However, the devil is in the detail. Already a moral victory for our side – last year we lost 14 and won 1. Okay, I am stretching the point but whatever! 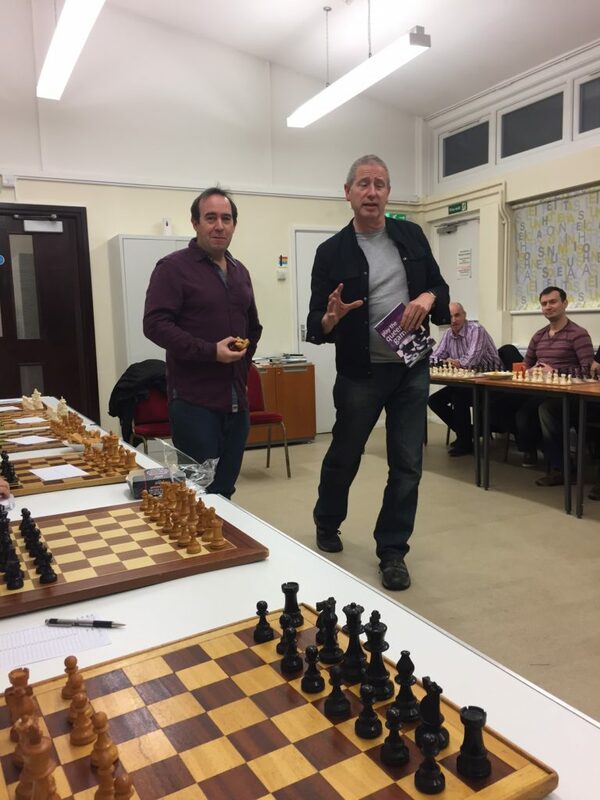 The hero of the evening was Marios – playing his first ever Benko Gambit – who recovered from a lost position to triumph with excellent endgame technique to force the win. Marios admitted that Carsten, our victor from last year, had given him excellent advice the previous night in the pub. Always a good source of inspiration. The hero of the night – what a prize!! His prize? A signed copy of the Queen’s Gambit book…. written by Chris himself. Other highlights from the evening were our WOSF of a Chairman, who rescued a lost position to force a draw – as everybody knows Bajrush has the unique talent of posing questions in any position. Chris, possibly inevitably (it was well past 11pm) missed a resource and Bajrush pounced. The draw was agreed. WOSF has a cuppa while Pavel frets!! 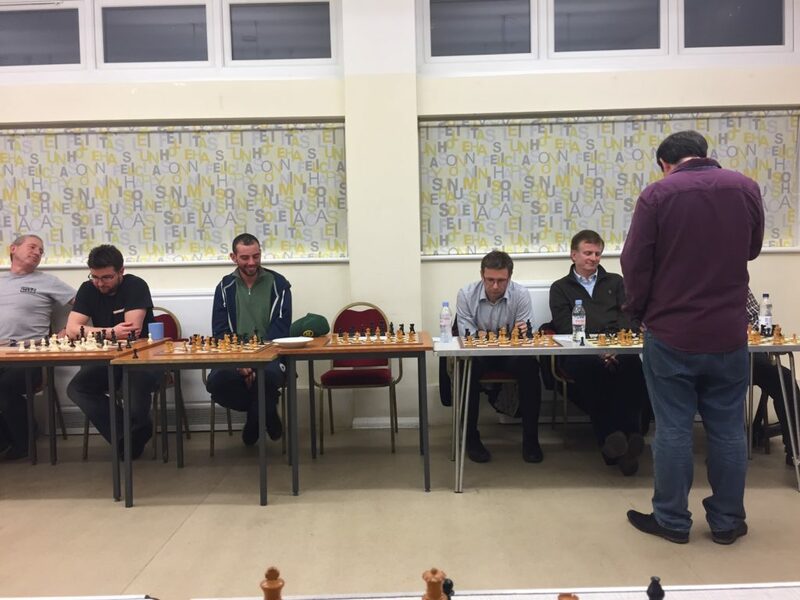 The funniest moment of the evening involved two of our Irish members, John and Orial, who contrived – despite being 3 boards apart – to play the same variation. This was totally unintentional and Chris only realized by about move fifteen he was playing the same game twice. To mark this unusual event, this variation will be forever dubbed the “Munster Twin Variation”. Sadly, unlike the rugby team, it was not victorious in either case. 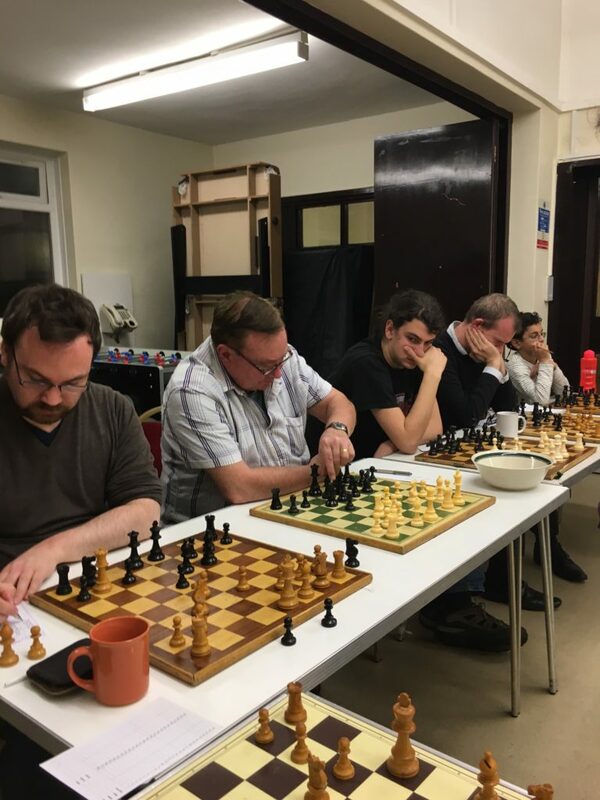 The unluckiest player of the evening was David, who played brilliantly to achieve equality and then threw in a tactical show of Qc5! This wrecked Chris’s pawn structure and gave the advantage of Bishop over Knight. The added bonus being he controlled the b-file with his Rooks. Confidence was high on the Hammer side. 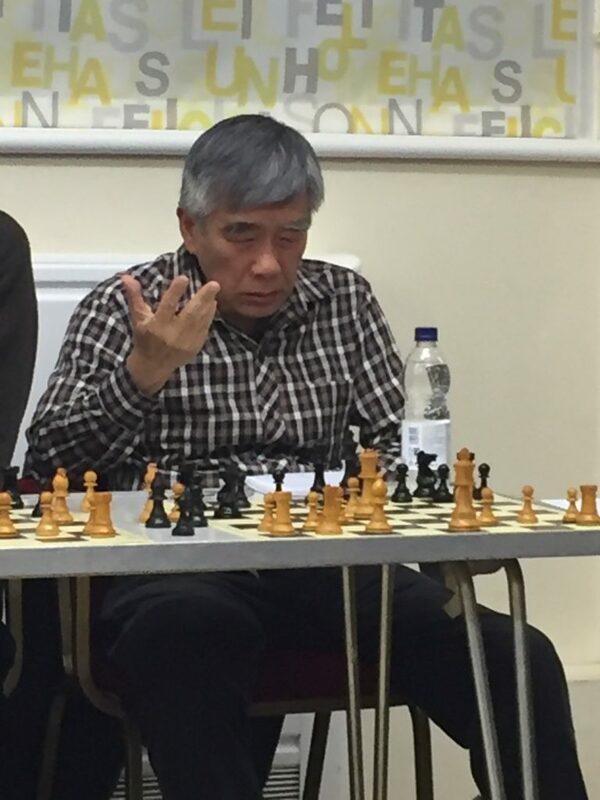 Unfortunately, Grandmasters do not give up easily and through a combination of clever manoeuvring and sheer willpower, Chris got back on terms and then started to squeeze. David cracked and Chris had secured another win. A great game from David and so unlucky. 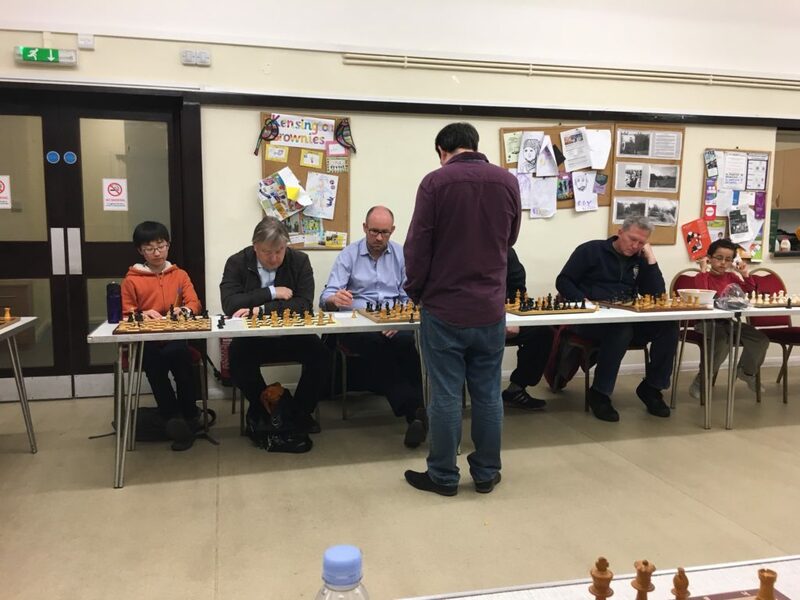 Our guest from Battersea, Tim, also played an excellent game and achieved a material advantage of Rook against minor piece and a pawn. 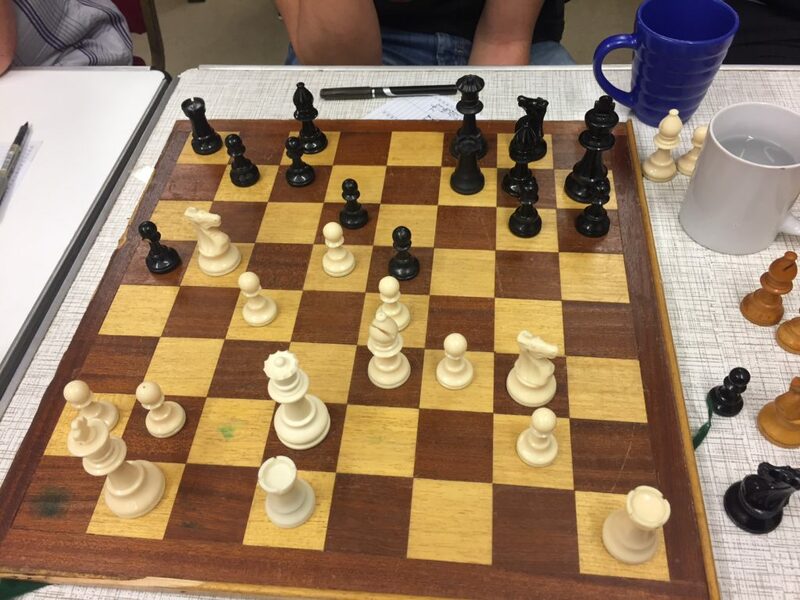 Unfortunately, Chris simply rearranged his pieces and continued with his King side attack. Another great struggle ended in another win for Chris. I must also commend Pavel, playing an extreme version of a Schliemann he had chaos on the board after about 7 moves. Chris sank into thought and in the end accepted a piece sacrifice to win the King’s Rook. The move Pavel missed was Be6 when the situation would have been as clear as mud. This chance came and went and Chris smoothly converted. Spaghetti all over Pavel’s board at the end. Brutal! Adam played an Albin counter gambit and again Chris sank into thought. The position was double-edged until Adam played Na5 with ideas of penetrating on b3. However, Chris negotiated all the tactics, a desperado piece sacrifice and then secured the win. The best of the rest?? To the best of the rest, our three participants from SW Junior Chess Club acquitted themselves very well. Their coach Tony Noccoli would have been proud of them. Chris, with great grace, turned down draw offers and clocked up another three wins. The rest of the Hammer crew went down in a blaze of glory – well, to be honest Chris was not in any danger and simply used his superior skill and technique to win comfortably. As for me, I secured a draw at 11.20pm. My result was down to the combination of several factors: the sacrifice of other players, the time and the fact I had supplied Chris with beer, crisps and sausage rolls (the secret plans and clever tricks angle!). I think he realized he was morally obliged not to crush me like last year! Our thanks to Chris for a top, top night! This takes my simultaneous career results against Chris to two draws and a painful loss. The three games span twenty-five years and a 33% return is not bad for a keen wood pusher!!! Finally, I must also mention our Secretary Mike, who setup the boards and tables for the event. We are lucky to have him. A clutch of games for you this week – coming thick and fast as the finish line comes into sight. Read on! It was a case of revisiting old rivalries as we faced Battersea in Division 4. On the one hand they’re a great partner club – working with us on the birth of the Summer Leauge, hosting us at their home venue for the El Chessico, and sharing some memorable matchups over the years. On the other, they’re like a slightly annoying little brother. Trolling us on Twitter, calling themselves “Battersea” when they play in Clapham Junction. Too big for their boots!! This is one with a little bit of extra spice! We played well, but the bottom-line is that we’re 2-4 down with the final couple of games adjourned for another time. The games are pretty tight but we have winning chances in both so things remain in the balance. 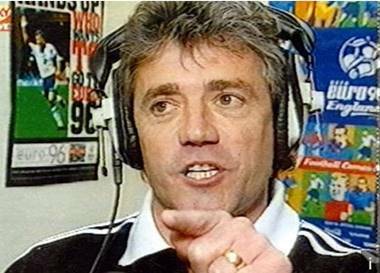 To quote Kevin Keegan, I would love it if we got something from the match! Love it! I sat out the match and spectated from the sidelines instead. This all meant I was able to catch a bit more of the action than I normally manage. Another observation is how slowly 3 hours seem to tick by when you’re just watching. It flies by when you’re in the middle of a game! Things didn’t start well. We had an early faller on Board 7 as Chris succumbed within an hour. Picking up the Black pieces, Chris allowed an early check which forced him into a slightly cramped defensive position. His opponent played actively, kept up the pressure and managed to win a pawn. An unbalanced position resulted, and thanks to his Bishop being placed on a “stupid square”, a resignation soon followed. Brian kept up his fine run of form on Board 1, chalking up yet another win. He’s now unbeaten in 8! 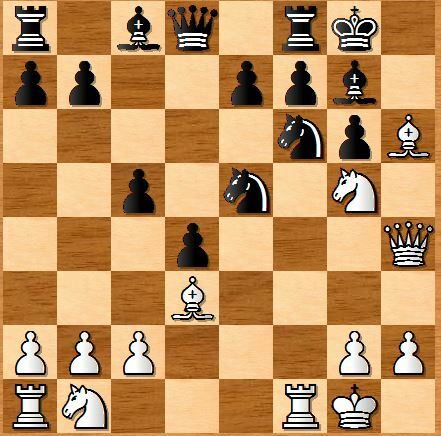 He initially looked in trouble after being forced to move his King following a check with Bh5, but a locked-down position developed in the middle which meant his centralized King was in no danger. The setup seemed to play into Brian’s hands and he superbly marshaled the pawn chain to his advantage to raise the spectre of a decisive passed pawn. The next two games contrasted in style but alas, not in the result! John, playing White, played his usual solid positional game and emerged in the early middle game with a respectable position. Ladies’ fingers were on a3 and h3, and we looked in for a long night. John’s opponent sensed a potential weakness in his pawn structure though, and began pushing g/h pawns to challenge it head on. A good tussle followed but John was forced to defend and as we all know, it’s a lot easier to attack than to defend. The breakthrough exposed the King and he graciously resigned. Robin’s game started unusually quietly. Where was the pawn push?? Where was the sacrifice? We didn’t have to wait long though; the fireworks started soon enough. the pawn break came, creating a wildly unbalanced position. Unfortunately it favoured Robin’s opponent who held the centre with 3 (count them) extra pawns. Not one to give up, Robin brilliantly fought back with a Knight pin, but whilst material was equal, the position was not. Robin’s pieces were not coordinated which made covering all the potential attacks very difficult. 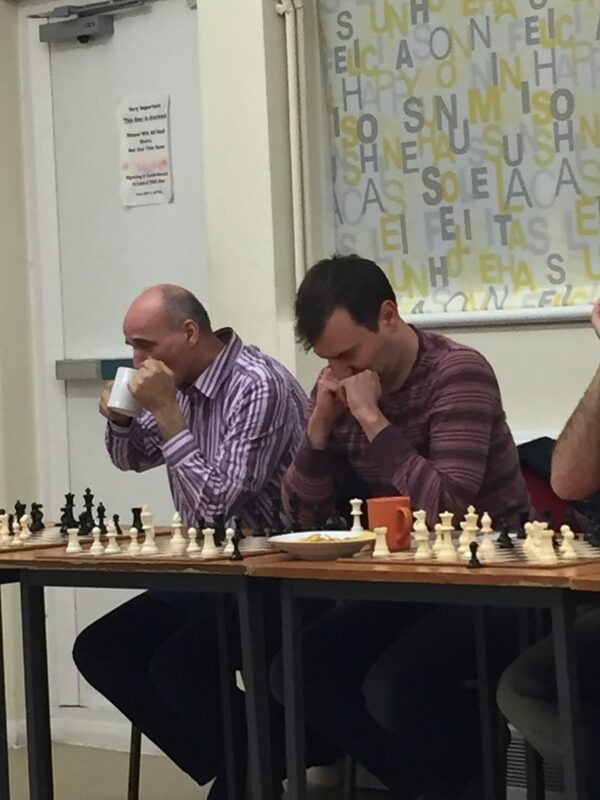 A fork on Rook and Queen effectively ended the contest, despite an unsuccessful 10-move hunt for a stale-mate!! 1-3 down. Josue starred in perhaps the most enjoyable match of the evening, at least for this spectator. The endgame was a bit of a thriller. He looked on the ropes in a Bishop/Rook vs 2-Rook end game, particularly when he was forced to defend a passed pawn one rank from promotion. But he had a passed pawn of his own, which he pushed whilst gaining tempo with discovered checks. The opposition passer was sacrificed with all hands on deck to prevent the coronation of a new monarch. Again, Josue found the right tactic and created a blockade with Bishop and King. Great to watch. 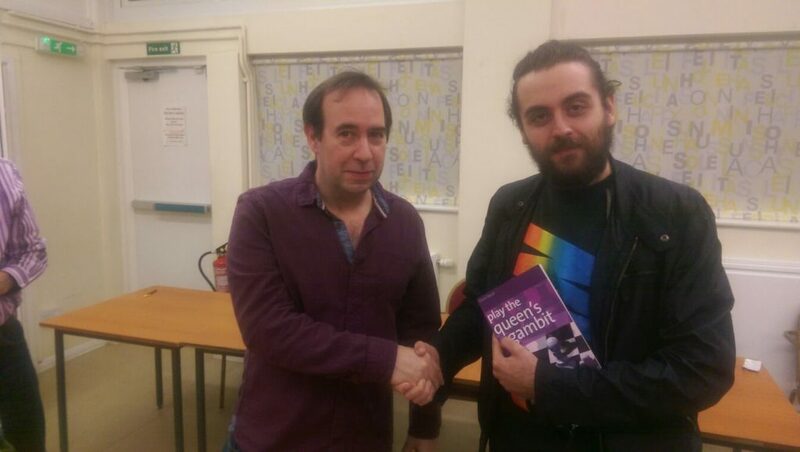 Finishing at the same time was Adam, who also found himself in a Knight & pawns endgame. It looked relatively level to me, but who’s to say what Fritz would make of it. Either way, nothing is easy when you’re short on time. It was the kind of position where you’d want 10 minutes per move, not 3 or 4 for the whole lot! Really unlucky. If the Knights were off the board it might have been a different result. David P and Marios both have slight edges in their adjourned games, but they’re really tight. Probably best I don’t say too much with the games still going, but I know Marios feels slightly disappointed not to seal it on the night; he had pressure from move 1. David played very well to gain a pawn advantage but his wily opponent defended well. A 127 on board 8 – not too shabby. The Middlesex League season is drawing to a close. 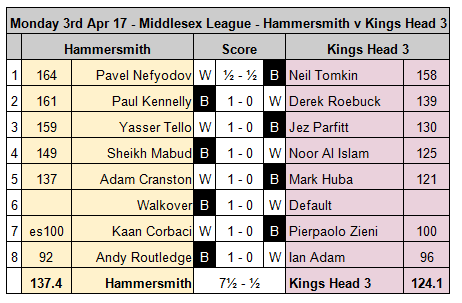 Another fine win last night saw Hammersmith move to a whopping eight out of nine with three to play, and a colossal games score of 56-16. Andy’s opponent played a very strange opening, placing his pawns on d3, e4 and f3 with his Bishop inside the pawn chain. Andy developed a large positional edge before a dubious Knight sac on e4 left his opponent with big chances to get back into the game. Andy continued to develop well though, castling Queenside and creating a dangerous Rook pair on the d-file. After his opponent’s passive Queen retreat to g1, Andy smelled blood! As he brought his pieces in for the kill, White elected to hand back the Knight in exchange for some activity. 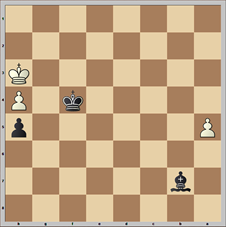 It was not enough to prevent the onslaught though; White soon resigned with mate-in-5 inevitable. Kaan chose the English opening 1.c4, with his opponent choosing to adopt the tricky 1… c5 symmetrical variation. A sharp tactical struggle ensued, with Kaan coming out an exchange up. Without too much trouble he put his material advantage to good use, grabbing another pawn and soon the sustained pressure forced resignation on move 23. A last minute drop-out meant Hammersmith superstar Robin was brought in to do battle. Or so he thought! With no sign of his opponent after 30 minutes, the default was awarded. Adam’s London System woes this season were set to continue. His opponent chose a King’s Indian setup and castled early, to which Adam responded with h4. 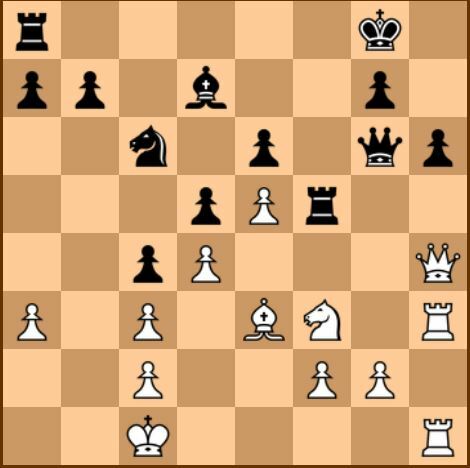 The early attack was destined to fail – with the e5 square not available for his f4 Knight, Adam brought it back to h2, where it stayed completely inactive for the next 19 moves! Castling Queenside added to the misery; Black immediately launched a Queenside attack to which Adam had very few pieces available for defence. The position was objectively lost, with at least 3 different ways for Black to cash in. Then the game turned. Some slow and inaccurate piece-shuffling on Black’s back ranks allowed Adam’s hopeless h2 Knight to become a superstar! An h2-f1-e3-d5 manoeuvre brought it to the best square on the board, where it stayed for 6 moves, before gobbling up the Black Queen that was kindly placed on f4. A very lucky escape! Disregarding his usual repertoire, Sheikh chose to adopt the classical line of the Scandinavian Defence. He proceeded accurately, developing his pieces in the correct order and blocking off all the light squares. He soon started attacking down the Kingside, and eventually overcame his opponent with a clever Bishop sac. Yasser opened with the Queen pawn and faced the Nimzo-Indian Defence. Yasser chose the 4.Bg5 Leningrad variation, and soon obtained a positional edge and a strong Bishop pair. As Yasser pushed his pawns down the Queenside, Black’s position became more and more cramped. Soon he was forced to give up a pawn, which did nothing to stop Yasser crashing through and scoring the win. Paul chose to adopt the solid Berlin Defence, and his opponent was not sure how to react. 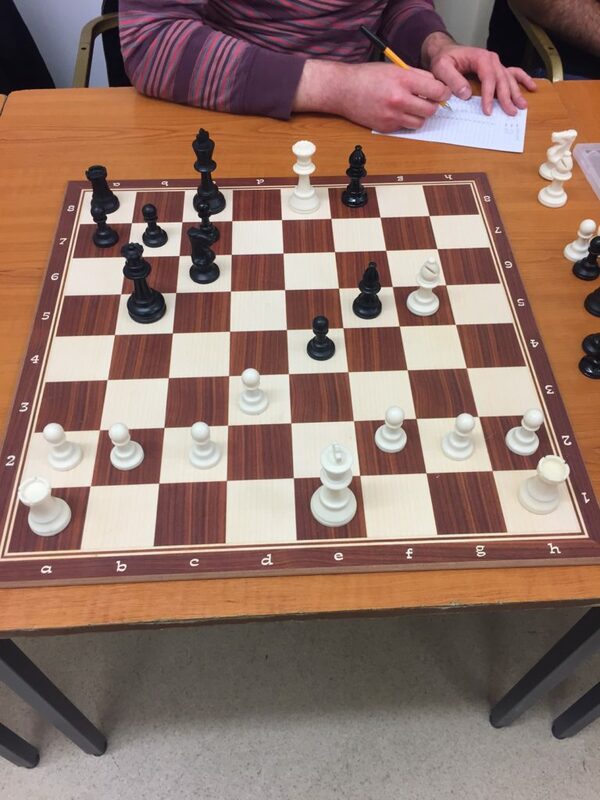 Several pieces were swapped off and before long Paul was in an endgame, but possessed the superior pawn structure. 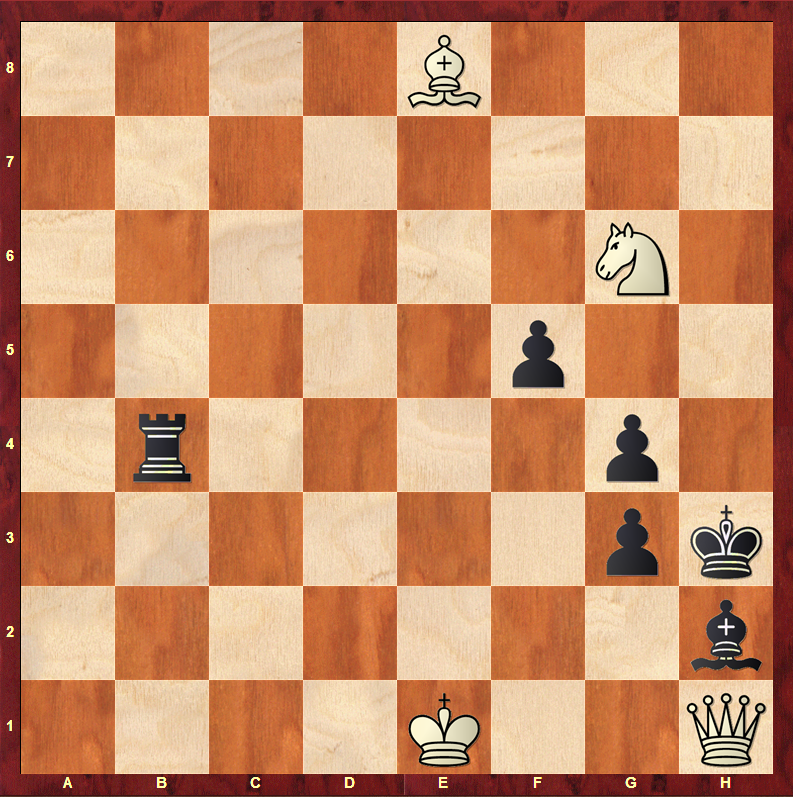 Paul’s superb endgame skills came into play, and before long he was exerting tremendous pressure on White’s weak spots. He coolly converted this pressure into an outside passed pawn, and his opponent resigned as his position started to crumble. Pavel scored the only draw of the night, though it was by no means a boring draw. He chose to open with 1. Nc3, the Dunst opening. Play developed sharply, with both players castling on the Queenside and Knights hopping around the board creating lots of threats. Pavel gave up his Bishop pair to kill off one of the Knights, creating an unbalanced position that was difficult to evaluate. After a Queen trade and some interesting tactical shots well defended by both players, they agreed to call it a day. 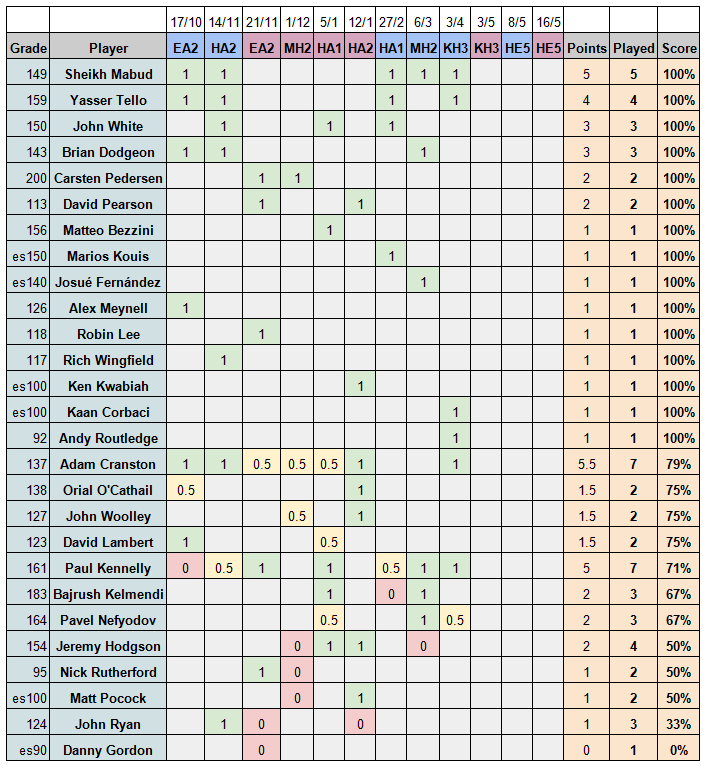 Kaan and Andy become the 26th and 27th players to play this year, and bring the number of players sitting on 100% to 15! Three games remain, including two big games against our only remaining title rivals, Hendon Juniors.